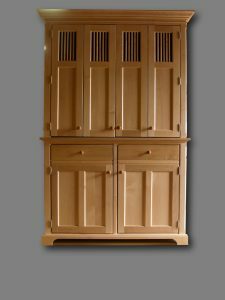 Our freestanding Working Pantries feature a concealed upper compartment behind bi-fold doors that includes a countertop and storage shelving that can be used to store small plug-in appliances and food, dishes or pots and pans. 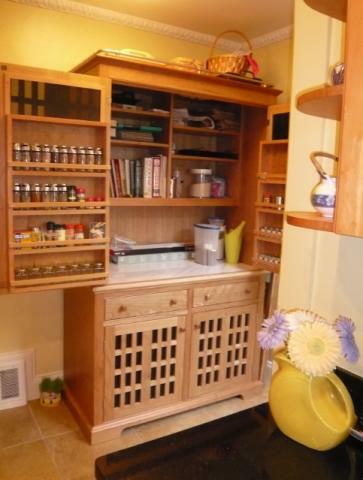 The lower section typically has two drawers and four roll-out trays. 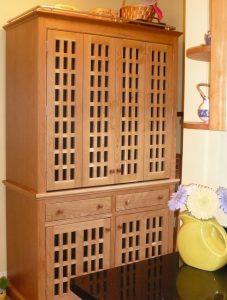 Their versatility allows them to be used as food larders, baking centers (use a marble top inside) dry or wet bars or butler’s pantries. Please click here to read more about Working Pantries. The WP48 above has a beautiful stone worktop edged in natural cherry to match its crown molding and shaker knobs. Lighting is now hidden behind a valence and has changed from Halogen to LED. 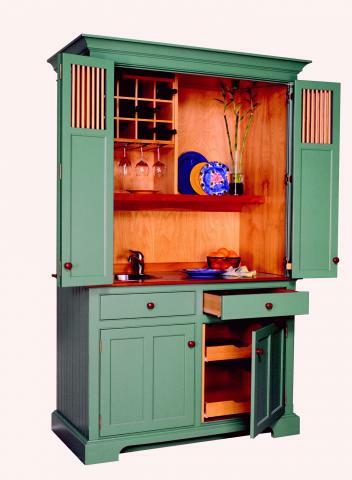 WP48 Wet Bar Armoire in Deep Ocean Green: 50 1/2″W x 26″D x 83 1/2″ H shown with flat panel doors with dowel vents, cherry shaker pulls and bead board sides. Interiors can be clear finished as shown or painted as shown below. 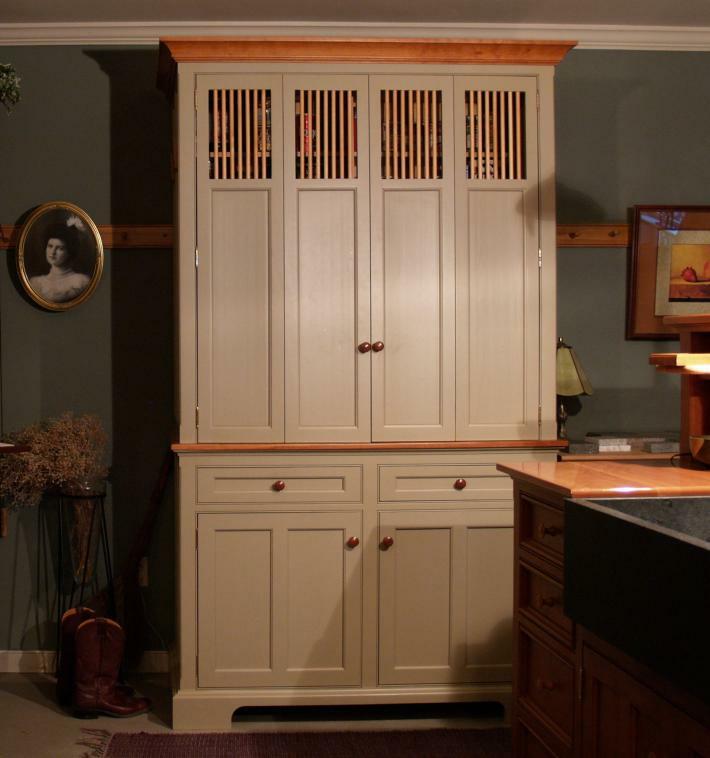 Note the counter top edge and the crown moulding are made of pine to co-ordinate with the 2 flanking workstations. 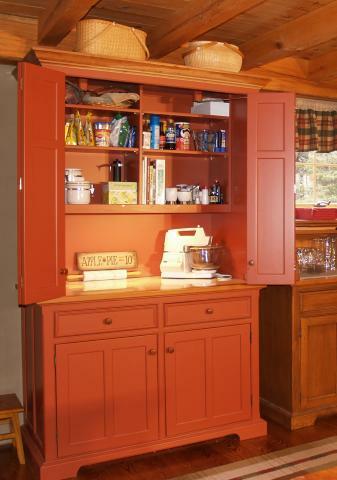 WP54 Working Pantry in Ox Blood: 56 1/2″W x 26″D x 83 1/2″H used as a dedicated baking center with a marble counter top. 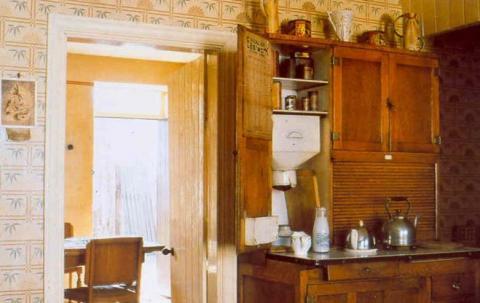 Think of an unfitted Working Pantry as a modern day Hoosier cabinet (image above) , you know, the one that Great Gramma had in her kitchen with the flour and sugar bins, a meat grinder and the porcelain, pull-out countertop. 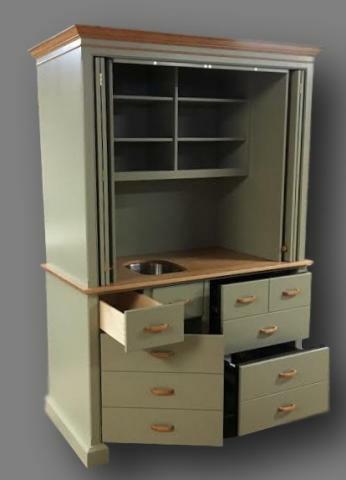 SZ-5-WP-54 Hospitality Center in Faded Green: 58 1/2″ W x 28″ Deep x 87″ H. It is shown with a beautiful cherry counter top that is finished with a durable polyurethane finish. The Subzero (or KitchenAid) refrigerator/freezer drawers also have an ice maker which makes it the perfect unit for a convenience center. Hospitality Centers are very similar to Working Pantries, except that they typically include a sink, refrigerator and small microwave. Other plug in small appliances like single burner cooktops, toaster ovens, blenders etc. can add to the utility of this beautiful piece that hides everything. 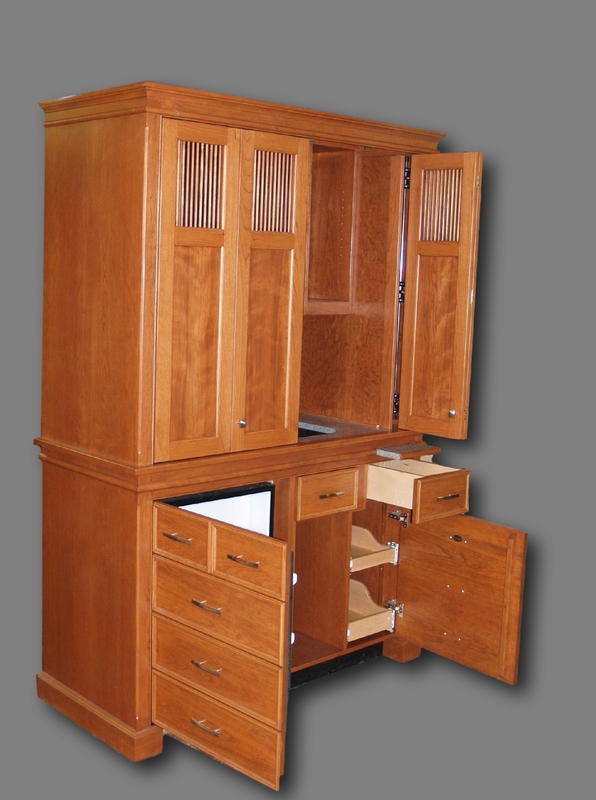 Hospitality centers do not have a built-in oven or cooktop and therefore they do not have (or need) our power cutoff safety features allow our Mini-kitchens to conceal the higher powered appliances. However, very nice plug-in movable burners, toaster ovens, small microwave ovens, coffee makers and other small appliances that plug in can be used. 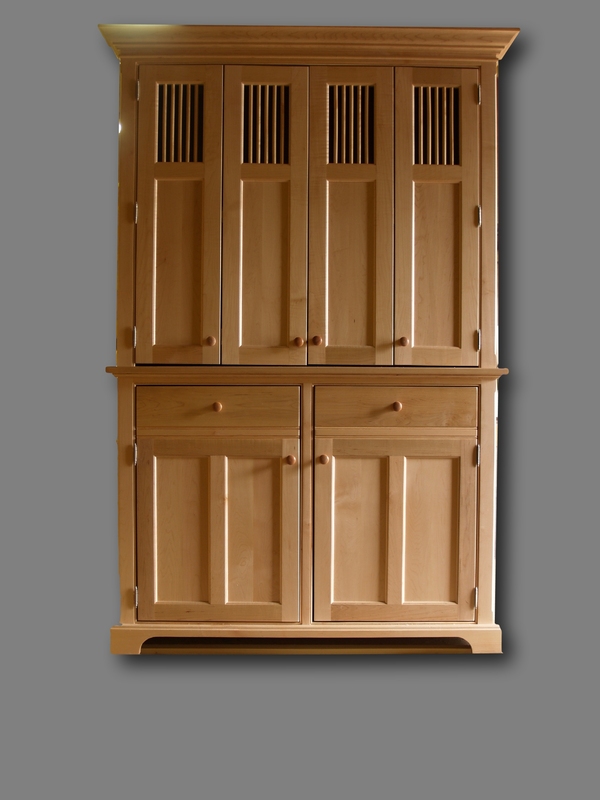 The Armoire styles feature bi-fold doors and include the WP42, WP48, WP54, SZ5-WP-54 (shown directly above). The UK68B Mini-kitchen series features bi-fold, pocketing doors and can include a wine cooler, party sized ice maker or dishwasher. These wonderful unfitted accent pieces are great for use in master bedroom suites, guest suites, game rooms, home theaters, home offices, and executive offices. Please contact us for ordering information or a complete list of these models and their starting and average prices. 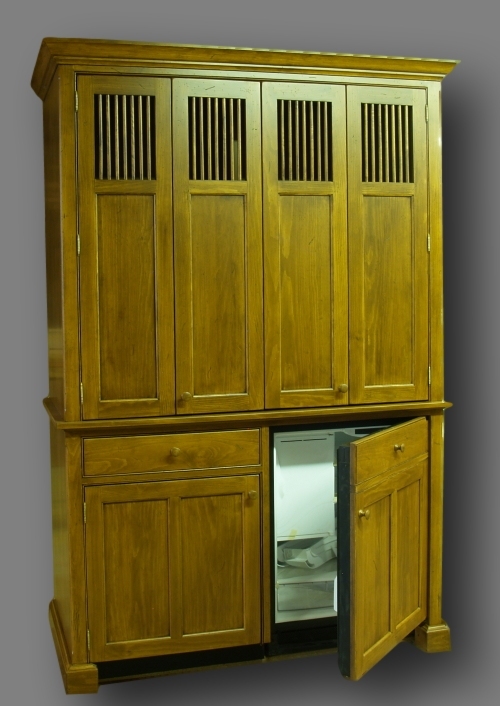 Refrigerators include a 2.5 CF Hospitality refrigerator/ freezer that is concealed by an independent lower door. Built-in 5.7 CF automatic defrost undercounter refrigerators in several models are recommended for more frequent usage. 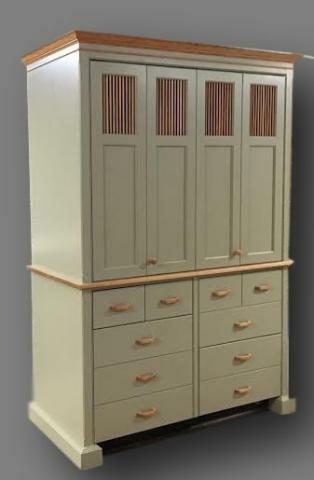 WP-54 Hospitality Center shown above in Faded Green: 56 1/2″ W x 28″ Deep x 87″ H. It is shown prior to shipping with dowel vent flat panel doors and a beautiful cherry counter top that is finished with a durable polyurethane finish. The Kitchen Aid) refrigerator/freezer drawers also have an ice maker which makes it the perfect unit for a convenience center. 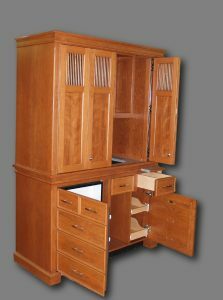 This armoire has optional pocket doors as there was not enough room for the standard bi-fold doors to open. 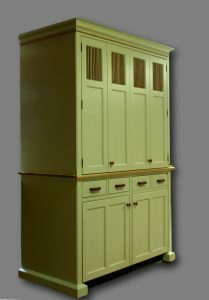 This pine WP54 features a U-Line refrigerator/Freezer and Dowel vented flat panel doors. 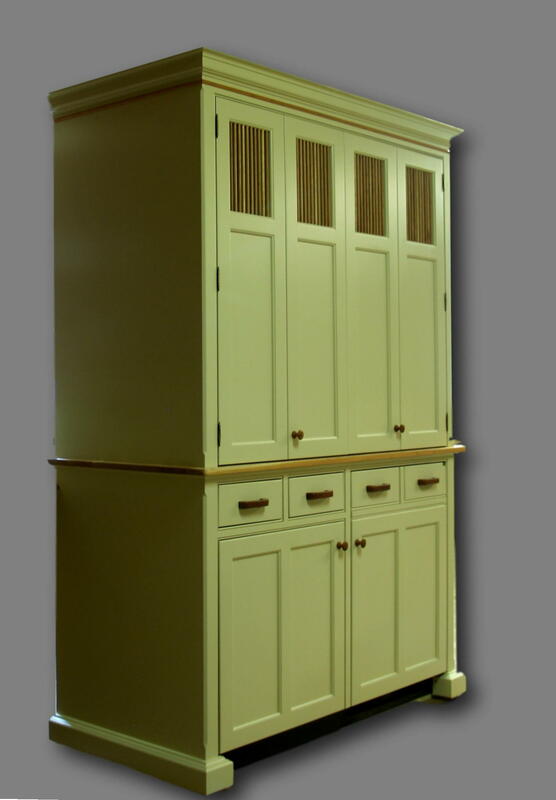 This WP48 Working Pantry in natural Maple features Dowel vent flat panel doors and our largest crown molding. 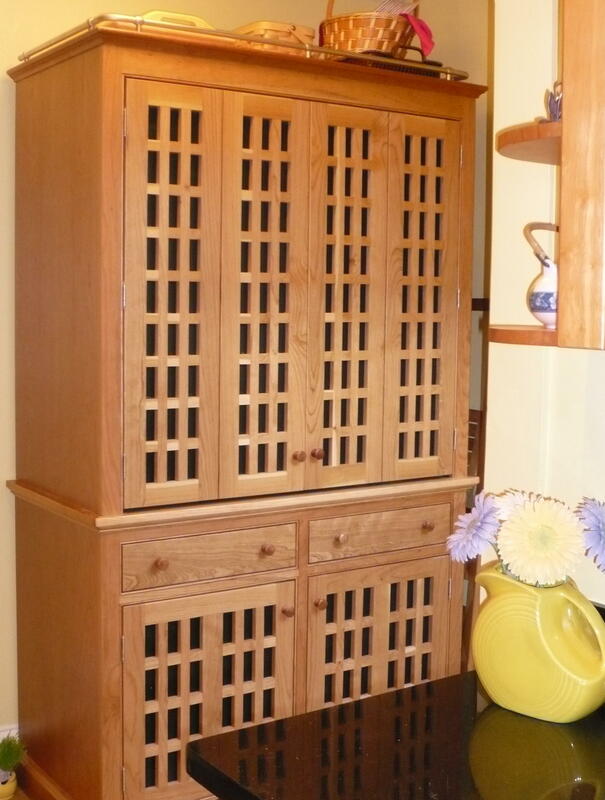 This elegant unfitted natural cherry Working Pantry (WP48) with grid doors and midnight black panels is used as a Baking/Pantry. 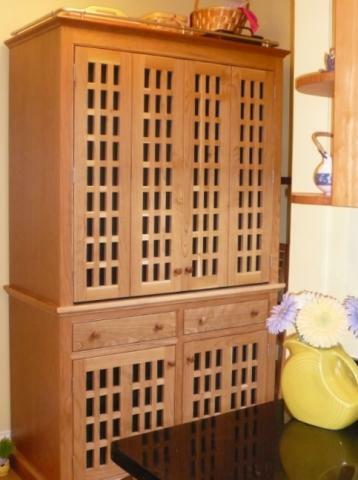 The grid style doors were inspired from the Hatch Covers on old sailing ships. 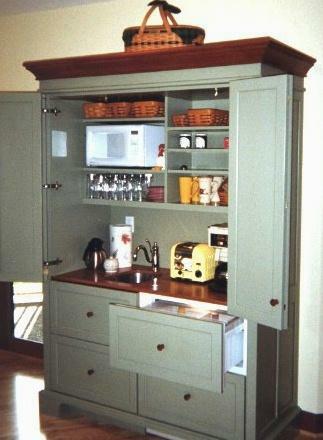 The interior features a marble top and storage shelves attached to the back of the doors. The Crown is our matte nickel bar cornice that completes the Nautical look of this piece. 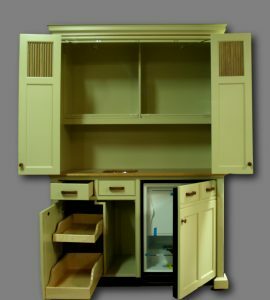 A hospitality center could look very similar to this working pantry, but would have an under counter refrigerator and a sink inside. This natural cherry UL68B-SR with dowel vent flat panel doors, raised molding drawer panels is reversed due to the location of existing plumbing. This WP54-BF-6 Hospitality Center has flat panel doors with dowel vents and is painted a custom color with some stained accent trims. Shown here just before shipping, it reveals ample hidden counter space and roll-out trays for storage below.